The use of driver retraining courses as an alternative to penalty points and a fine has increased by more than a third in the past five years, new figures show. 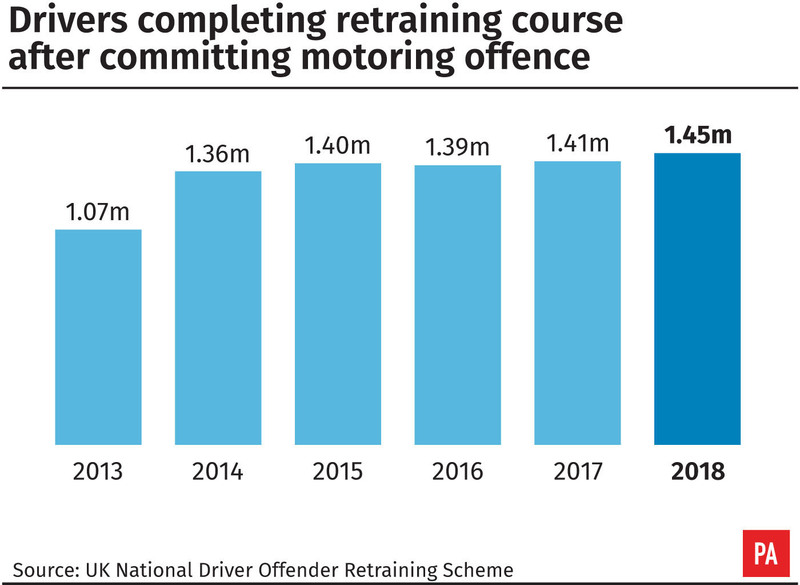 Press Association analysis of data from the National Driver Offender Retraining Scheme (Ndors) found that 1.45 million UK drivers completed a course after committing a motoring offence in 2018. This is up 36% on the total of 1.07 million in 2013, and means the courses have been attended by more than 10 million people since 2010. Speed awareness courses were by far the busiest last year, with 1.19 million attendees. Nearly 110,000 motorists were sent on recently introduced motorway awareness courses. These are focused on boosting understanding of smart motorway laws such as variable speed limits and the use of red X signals to illustrate when the left hand lane is closed. Steve Gooding, director of the RAC Foundation, said: “This data suggests that, astonishingly, as many as one in four drivers has now been sent back to the classroom for breaking road traffic law – hopefully to emerge as ambassadors for better, more responsible motoring behaviours. Eight different Ndors courses are provided by private companies on behalf of the police. They are offered to drivers who commit a minor offence at the discretion of police forces, as an alternative to penalty points and a fine. Drivers cannot attend more than one course within three years. The amount that drivers can expect to pay for the courses depends on where they live. Ndors said in 2017 that speed awareness courses ranged from £75 to £99. Courses are provided across the whole of England, Wales and Northern Ireland. Only some of the courses are available in Scotland. A spokesman for UK Road Offender Education, the organisation responsible for managing Ndors, said recent independent research showed the courses were more effective at reducing speeding over a three-year period than issuing fines and points.